1: Scene from “The Wheel,” first season finale of "Mad Men"
Uh… it sells projectors to people who already have them? Yeah. The wheel. Stacks. You store your slides in it and it’s ready to go. I took pictures for the paper at Wisconsin; the machinery is definitely part of the fun. It’s mechanical. What’d you take pictures of? Girls, mostly. You could go up, and ask them their names afterward, like you were going to put it in the paper. And some other stuff. Artsy-craftsy stuff. They gave me hell about it. Artsy, like what, like: relfection of a tree in a pond? Uh, worse. I did a whole series that was just handprints on glass. You know the way it fogs up around your heat? Take it off, take a picture. Black and white, I suppose. Of course. I was always fascinated by the cave paintings at Lascaux. They’re, like, seventeen-thousand years old. 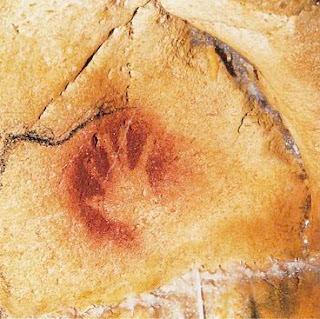 And then bison get all the attention, but they are also all of these handprints, tiny by today’s standards, with paint blown all around them. But I thought it was like someone reaching through the stone, right to us: I was here. Don bobs his head, falling asleep.